Unfortunately today’s big band concert has been cancelled due to concerns about travel to and from the event with heavy snow forecast over the lunchtime period. As the band members travel from far and wide to be here we respect their decision to postpone. we will be in touch with ticket holders on Monday to offer refunds and advise if we are able to reschedule this concert for next Sunday 25th March. The first 3 tunes off Charlie Mingus’s classic album ‘Ah Um’ are, ‘Better get it in your soul’, ‘Goodbye pork pie hat’, and ‘Boogie stop shuffle’. So that’s gospel, blues and boogie for starters. The Sunday Big Band are going to play them all and more. Joe Zawinul played with Cannonball Adderley and wrote several of Cannonball’s hits including ‘Mercy mercy mercy’. Joe went on to co-found Weather Report in the 70’s and wrote ‘Birdland’ and ‘Black Market’. ‘Birdland’ has become one of the biggest hit tunes in all of jazz. The Sunday Big Band is a collaboration between members of different big bands. This Sunday’s program is at the Def Tone 17 end of the big band spectrum. Should be fun, raucous and with plenty of fiery solos. CICCIC have only got themselves a Big Band residency! How many places can you say that about? 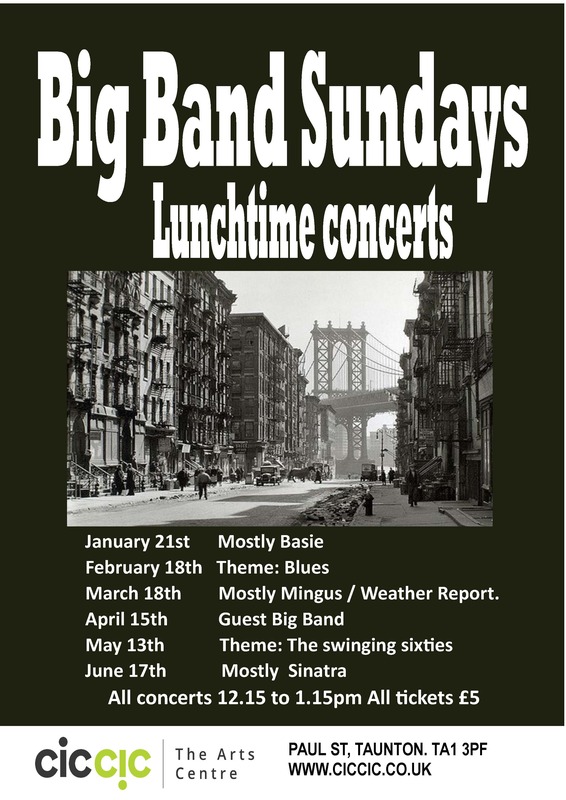 Over the next 6 months from Jan to June on the 3rd Sunday of the month there is going to be one set from a 17 piece big band at lunchtime. Each month will be a different theme with different tunes. There is nothing wrong with Glenn Miller, but we are aiming to show the widest possible range of big band styles. 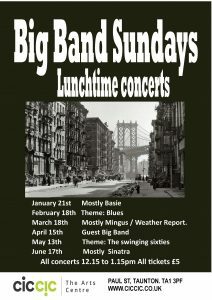 The first two are ‘the Sunday Big Band plays Count Basie’ (Jan 21) and ‘the Sunday Big Band plays the Blues’. (Feb 18). The Sunday Big Band is going to be a collaboration between different Big Band musicians. There is a jazz tradition of ‘workshopping’ tunes in public, but we are going to save you the workshopping and just bring you the good stuff.